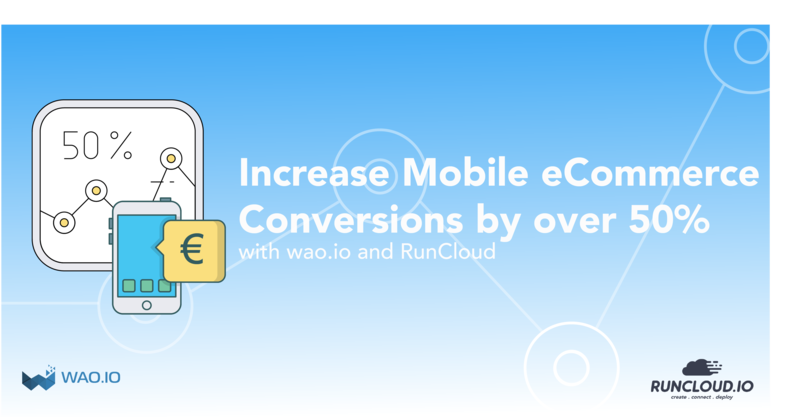 In this article we are going to look at how you could possibly increase mobile ecommerce conversions by over 50% with wao.io and RunCloud. Together we believe they provide an optimal solution to leverage the power of the cloud for your mobile eCommerce application deployment. At RunCloud we aim to provide you with an easy to use service that allows anybody to deploy web applications onto a highly optimised and easily managed cloud server. The RunCloud platform works with all major Cloud infrastructure providers, and provides a rich feature set to make managing your resources a breeze. wao.io combine their expertise in front-end performance, infrastructure and data science to provide a continual optimisation and analytics service. All other things being equal, using their service will lead to an increase in application speed alongside a reduction in network bandwidth usage. These factors, combined with better decision making afforded by deeper customer insight, should lead to increased revenue from conversions and reduced platform costs. In other words, higher profitability. The great news is the two products are joining forces to offer a more comprehensive solution. RunCloud.io is planning a full integration of wao.io to add to its existing services allowing customers to take advantage of the benefits gained from both products. Consumption has gone mobile and the market is everywhere, within easy reach of most consumers from the comfort of their very own pocket. This revolution is predicated on technological advancements in mobile communications and cloud technologies that are now beginning to realise a long promised and unprecedented level of consumer convenience. For e-commerce businesses everywhere this represents their biggest opportunity for growth since the birth of online shopping. “For e-commerce businesses everywhere this represents their biggest opportunity for growth since the birth of online shopping. We need only look at a few numbers to see the writing on the wall. In 2017 Global mobile traffic surpassed desktop traffic for the first time. Mobile phone user internet penetration, globally, is predicted to reach around 65% by 2019. 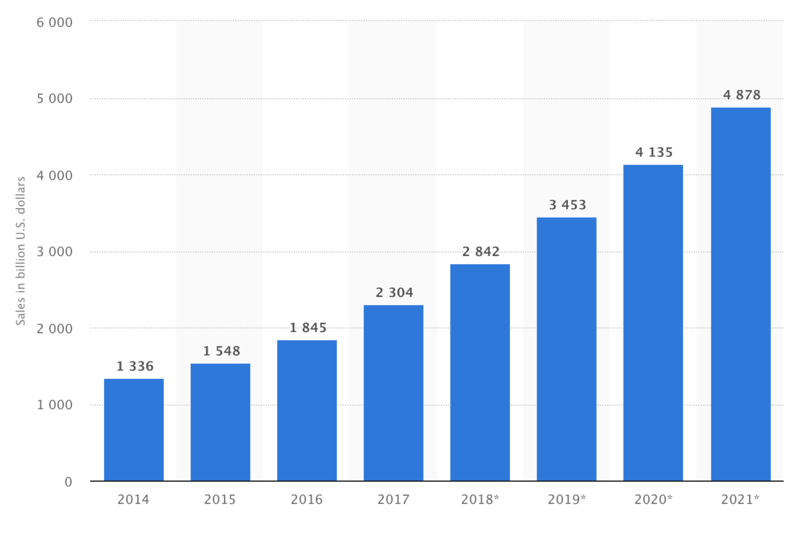 Increasing from 50% just a few years ago, this trend is likely to remain unabated as we enter an information age where people’s primary form of internet access is through their mobile devices. Worldwide e-Commerce retail revenue amounted to over 2.3 trillion dollars in 2017. A huge figure, but one that is predicted to more than double to a staggering 4.9 trillion dollars by 2021! The question, therefore, that every business must ask themselves is not only are you prepared for this, but are you fully optimised for it? Are you going to be able to fully leverage this opportunity to increase your sales, profitability and market reach? Because if you aren’t then you can be certain your competition is. “Are you going to be able to fully leverage this opportunity to increase your sales, profitability and market reach? Specifically, how fast does your mobile e-commerce application take to load? Page load speed of an e-commerce application is known to dramatically affect conversions and bounce – in other words, sales! There are other problems that consumers face such as data costs, but page load speed is the most immediate problem for any mobile e-commerce business wanting to reach their customer base. To get a better idea of the scale of the speed problem mobile eCommerce applications face we can look at some more numbers. SOASTA (now part of Akamai) release a bi-annual ‘State of Online Retail Performance’ report which presents findings based on analysis of one month of user data from the top online retailers, equating to approximately 10 billion user visits. Half of consumers browse for products and services on their smartphones. A 100-millisecond delay in website load time can hurt conversion rates by 7 percent, a 1 second delay by 20%, and a 2 second delay by 26%. A two-second delay in web page load time increase bounce rates by 103 percent. 53 percent of mobile site visitors will leave a page that takes longer than three seconds to load. Optimal load time for lowest mobile bounce rate was just 700 milliseconds. Optimal load time for peak mobile conversion was under 2.7 seconds. Bounce rates were highest for mobile phone shoppers. A one second slow down reduces average mobile session length by 24.9%, while a two second slowdown reduces it by over 50%. At peak traffic times, more than 75% of online consumers left for a competitor’s site rather than suffer delays. More than a third told others about their disappointing experience. These numbers paint a clear picture. Not only do slow sites not convert potential customers into sales, they actively drive them into your competitors arms. The speed of your site directly and clearly correlates to increasing or decreasing your sales. 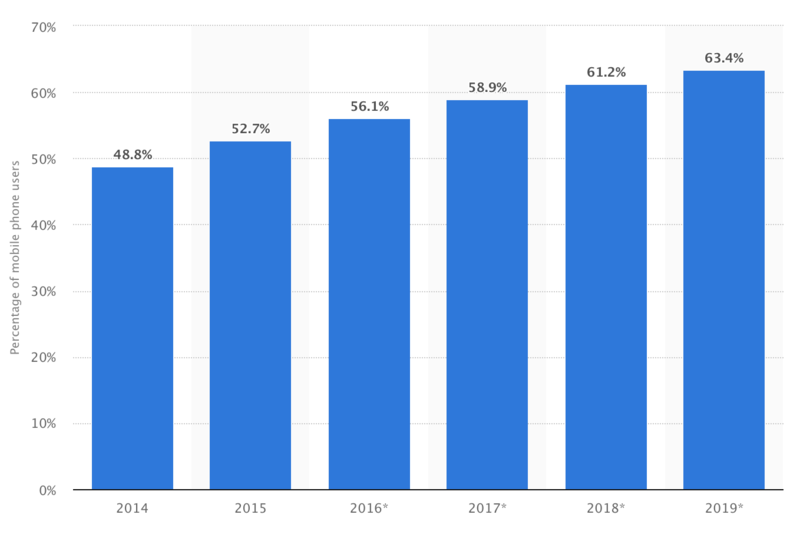 This goes a long way to explaining why conversion rates for eCommerce websites are generally not good, around 1.5% globally in Q1 2018. We also know that the average Global order value is around $110 in Q1 2018. Using these numbers we can predict an average daily revenue for an online store at different levels of user traffic. Predicted average daily revenue for an online store. But how much can we improve these numbers by increasing the conversion rate? How does load time correlate to conversion rate (mobile)? Since we already know that the optimal load time for conversions on an eCommerce site is 2.7 seconds or below, it is clear that the average online store could greatly increase revenue by optimising their platform. The research suggests that over half of the visitors to the average eCommerce store are leaving the site after 3 seconds, before the page has even loaded. The research suggests that over half of the visitors to the average eCommerce store are leaving the site after 3 seconds, before the page has even loaded. a slowdown of only 100 milliseconds… results in a 2.4% decrease in the sites conversion rate. Impact of page slowdowns on conversion rates. Given these numbers, we could predict that if we could improve the average eCommerce site’s page load speed to the optimal 2.7 seconds we should accrue something like a roughly 30% increase in the conversion rate. Predicted average daily revenue for an online store at 2% conversion rate. Possible daily/annual revenue increase after optimisation. But the question remains – How can we most easily and efficiently improve our eCommerce site page load speeds and reap the rewards of increased conversion? Many traditional hosting providers offer what they call ecommerce optimised hosting in shared environments. They claim their platform provides a perfect solution for online businesses. But when so much is on the line with regards to the effect of speed load times on conversions, do these offerings really provide an adequate solution? Liew has discussed the benefits of Cloud Hosting over Shared hosting in a previous article. It seems apparent that when it comes to the need for speed there is only one real option, move to the cloud. RunCloud’s feature rich platform lets you leverage the power and speed of the largest cloud infrastructure providers with the ease of use of a traditional GUI based management dashboard. 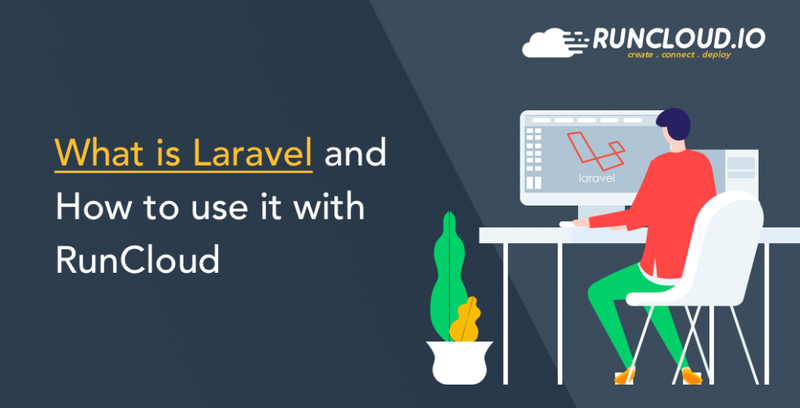 Not only that, but the RunCloud server stack uses the most modern best practices to ensure that your cloud server is tuned for the speed and security demanded by eCommerce web applications. However, this is only one half of the solution, to really benefit from the speed of the cloud you need to make sure your eCommerce Web Application is optimised and you have access to analytics to act upon. wao.io caches your website assets on their own infrastructure ready to be delivered to users in the blink of an eye. wao.io automatically and continuously optimises your site image assets with their proprietary algorithm to determine the fastest output format and best compression whilst maintaining visual quality. SVG images provide scalability without quality loss, but are often full of redundant information bloat. wao.io safely removes all this excessive cruft ensuring brilliant images at a minimum size. 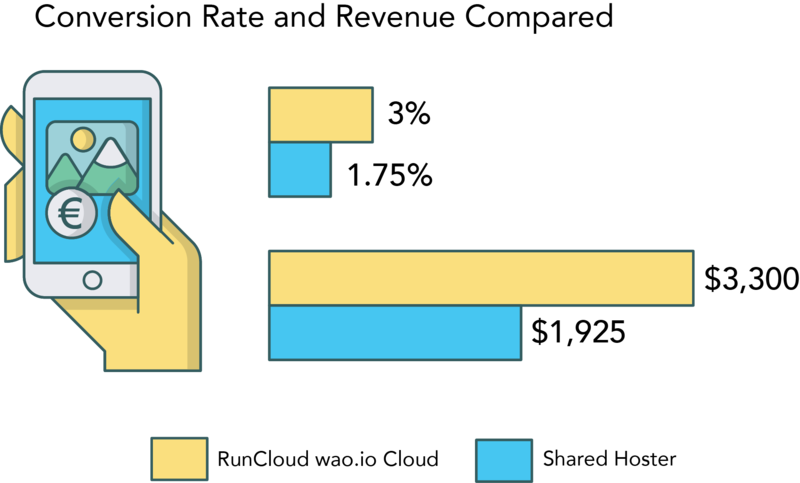 wao.io dynamically rewrites @font-face CSS rules to ensure the best possible webfont compression for delivery. wao.io provides dynamic and manageable minification of your sites JS, CSS and HTML assets via your account dashboard. On an image heavy site such as your typical eCommerce sites, it is not enough to just reduce the size of your images, you also need to ‘lazy load’ them. wao.io provides intelligent ‘Image delaying’ that only loads images when they become visible to users. 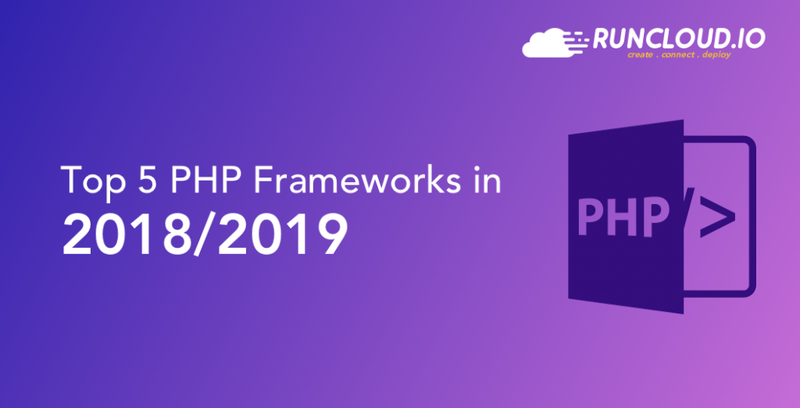 State of the art best practices are employed in the reordering of your web applications head elements in order to optimize the processing of the document and ensure the earliest possible render start. Client error tracking calculated as the ratio between defective page views and total page views. Page view(s) by the same user form a session. wao.io tracks how many page views form a typical session. Bounced sessions are excluded as well as traffic from bots. The bounce rate indicates how many sessions end directly after the first page view. To use the wao.io optimisations is as simple as changing the A-Record entry in your DNS settings. It takes between 5 to 20 minutes to be activated, no coding required. Setting up wao.io is a breeze! At the moment wao.io is focused on the European market closest to their infrastructure but has exciting plans to rollout globally in 2019. Optimisation still takes place on client sites no matter the geographical location but the the benefits are currently greatest in the European market. Their service will help increase your revenue by optimising your site for visitors and providing the insight you require to make better informed decisions. The speed increases delivered with wao.io combined with those achieved by deploying your application on a RunCloud managed Cloud server will result in higher conversions as illustrated earlier. In addition, the optimisations will not only increase speed, but they will reduce the resources required to serve your market, which in turn will yield cost savings that increase profitability. A double win. Rundowns of details and feature sets are great, but what we really need is to understand the problem with a real world comparison. So we figured it might be best to illustrate the problem and the benefits with a case study. For our case study we have created an eCommerce site full of mock products and their corresponding images and details. For our online store we have used WooCommerce, the eCommerce solution from Automattic that runs on the WordPress platform, it has been downloaded 42 million times and accounts for an astounding 42% of all eCommerce stores globally. We could have used any one of the other self-hosted eCommerce solutions such as Magento, Prestashop or others. The shared hosting we chose is regularly in the top tier in ReviewSignal’s WordPress hosting benchmarks. We chose their highest level shared plan which includes PCI DSS Compliance and is suggested as being suitable for eCommerce. Both testing platforms have servers located in Amsterdam and are comparably priced, $29USD per month for the shared hosting compared to about $33USD per month for the combination of Digital Ocean, RunCloud, and wao.io. Woocommerce requires object caching to be enabled otherwise transients can collapse the database, so we enabled Memcached caching on shared and Redis on RunCloud, but didn’t tweak any other configurations. RunCloud & wao.io optimised Cloud Hosting Median Results. 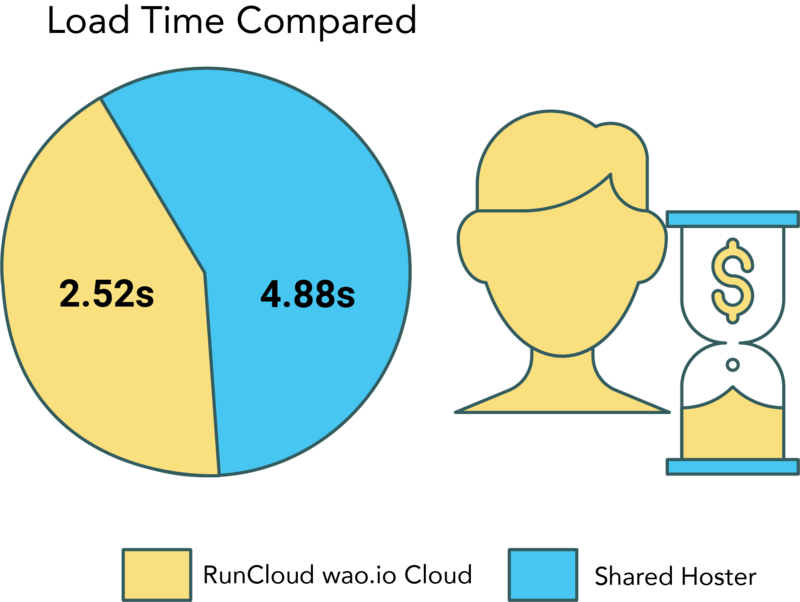 Immediately we can see the difference eCommerce store on shared hosting loaded in 4.882 seconds, whereas the eCommerce store using RunCloud and wao.io loaded in 2.522 seconds, well over 2 seconds faster. The shared hosting page load time falls in line with an expected mobile conversion rate of about 1.75%, while the RunCloud wao.io store page load time which falls in the sweet spot of under 2.7 seconds, from which you would expect conversion rates of around 3% on average. Comparison of predicted average conversions and revenue. Let’s look at those conversion statistics at different page load speeds again, and we can translate our comparison into revenue gains. Comparison of predicted average conversions and revenue @ 1000 Unique Visitors Per Day. From our research and testing we feel it is safe to say that one of the easiest ways to increase your mobile eCommerce conversions and revenue is to choose to use RunCloud managed cloud hosting in partnership with wao.io for your eCommerce web application. As you can see this powerful combination could easily reduce page load speeds on mobile by over half, which could see mobile conversions increase by over 50%, nearly doubling your revenue. To receive a 20% discount for wao.io enter Runwao into intercom after signing up. 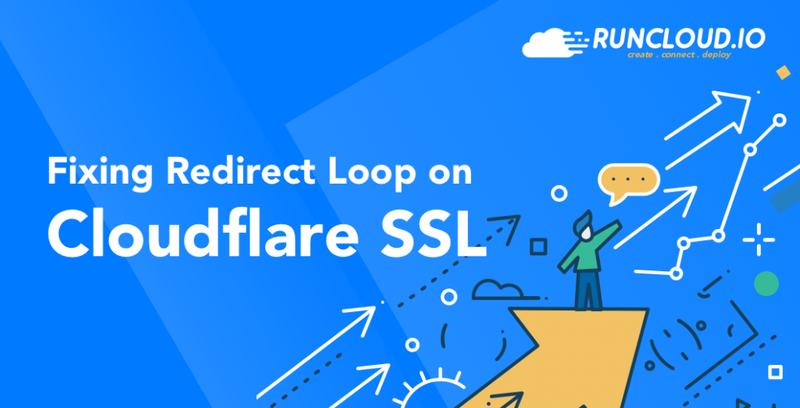 What is the difference between Wao and Cloudflare PRO or should be both used together? Hey Norbert, I asked the wao.io guys exactly this question. They told me, “wao.io and Cloudflare support each other, Cloudflare does a great job around DDOS and security, and wao.io is the performance booster”. They have a free trial, maybe worth a shot trying them together… maybe another article in there too! I tried out WAO free Analyzer (here http://rplg.co/wao) on a shop that is on Linode Cloud running Runcloud. Guess what, WAO result shows that with WAO, the website could be improved by 2% only. That’s nothing. So I can assume that Runcloud is already powerful enough to power a mid-size e-commerce shop. what site exactly did you analyse? Normally we see speed improvements between 20% up 87% with the analyzer. 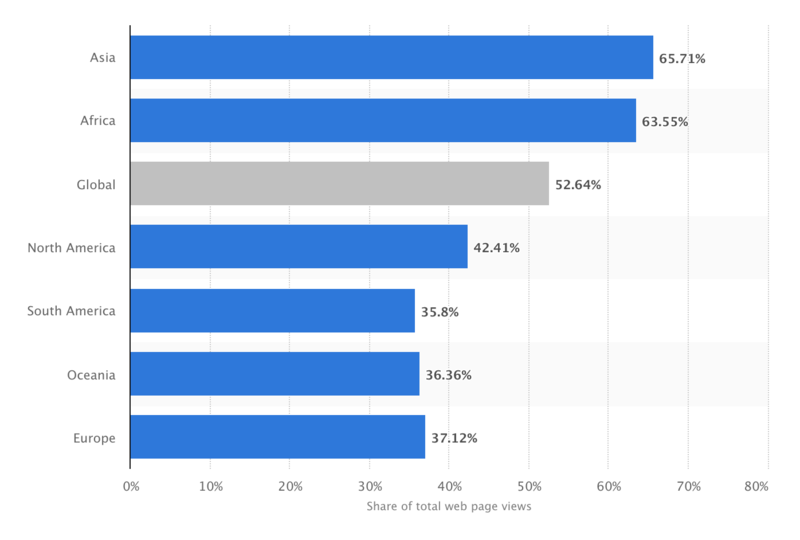 2% sounds low – depending on the total size of the website, it could be a lot as well. If you are already implemented all web performance measurements for your site, we can only applaud you. This is great for you and for your users!